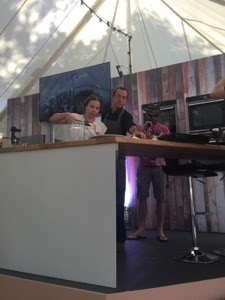 I spent most of my time eating and drinking around the The Feast Collective, a food lovers' haven, whilst at Camp Bestival (surprise surprise). 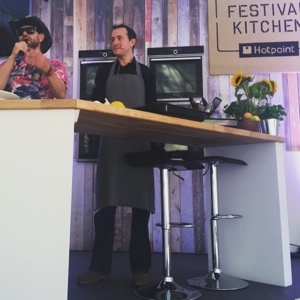 The Feast Collective is a celebration of exceptional, artisan food producers from across the UK. 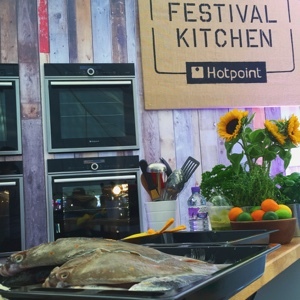 Throughout the weekend the Hotpoint Festival Kitchen showcased an array of chefs to guide you through kitchen woes such as 'how to make the perfect poached egg'. 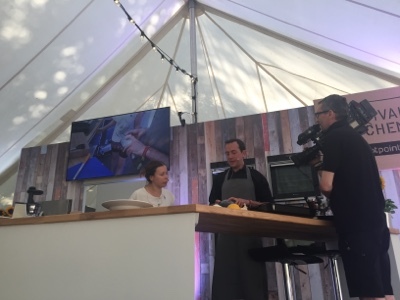 My favourite demo was by Joe Wheatcroft from Source in Bristol, who taught us how to fillet a fish. - A mild scent and moist flesh . 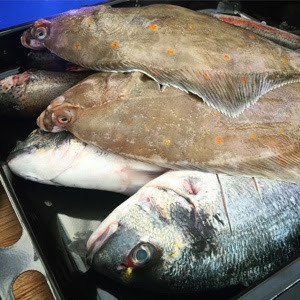 Don't purchase fish that has a strong, fishy odour. - Whole fish should have bright, bulging eyes. Avoid fish with cloudy or glazed over. - A fresh fish will have bright red or pink gills. - Whole fish should feel slippery and wet with their scales intact. - Fillets should look shiny and wet (the flesh shouldn't be flaking apart). - If the underbelly of the fish is budging it is showing signs of decay inside. As a general rule, Mondays are not a great day to buy fish because fishing boats don’t go out on Sundays. That means the fish being sold on a Monday was probably caught on Friday or, at the latest, Saturday, so might not be at its freshest. The exception to this is farmed trout and salmon, which can be caught any day of the week. 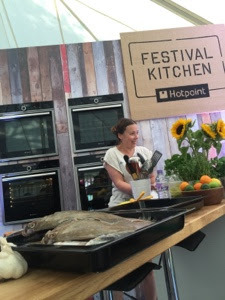 If you're purchasing a whole fish, Joe advised us to ask our fishmonger to descale it - the job is pretty messy and even tools that are designed to stop the scales pinging across the room aren't always reliable (we saw one in action and the floor was covered...). If you're planning to cook the fish whole then you will need to gut it, however if you're filleting the fish Joe told us to leave the guts in as it gives a stable base. To gut the fish use a knife to pierce the stomach of the fish using the small hole by the tail as a guide. Run the knife from the tail to the head, cutting open the stomach. 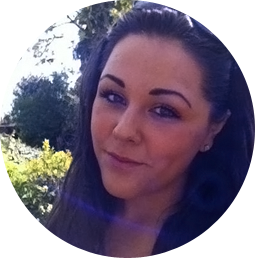 Clean out the contents of the stomach and rinse the fish in cold running water. 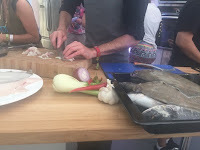 Put the scaled fish on a chopping board and, using scissors, trim off the fins by the head on each side, and any fins that run along the top and on the underside of the fish - the fish' spine is rather sharp so be careful! Make a long cut around the gills. With the tail towards you, run the knife down the spine to the tail in a gentle slicing - not sawing - action, working the blade between the spine and the flesh. Repeat until the fillet begins to come away - lift the fillet to see where you're working. When you get to the rib bones, let the knife follow the shape of the fish and slice over the bones. Once you've removed the fillet, set it aside. Turn over the fish and repeat with the second fillet, this time starting at the tail and working towards the head. Be careful - the second fillet may be a little trickier to remove. 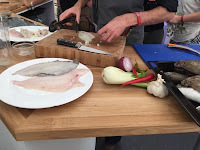 Removing the fillets on a flat fish can be done in the same way, however you may need to turn the fish round so that the tail is pointing away from you and cut from tail to head. Joe recommended that you should fillet the meaty 'darker side' first as it is easier to do and will create a flat surface for when you try to fillet the white side.